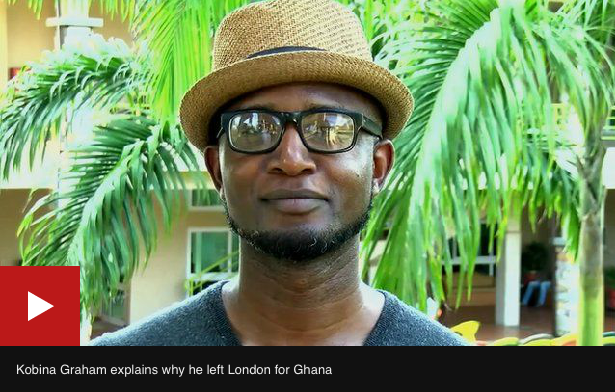 “Leaving the UK and going ‘home’ to Ghana” is an article by BBC News on reaspora, or reverse migration – the return of first and second generation immigrants to Africa. It comments on two video interviews with a lecturer/deejay and a businessman from Ghana, who have moved back to Accra from London in recent years. This article is useful to summarize a widespread view on reaspora that affects how Africans are being represented on mainstream media. In the interviews, Kobena Graham (born in London to Ghanaian parents) and Jerry Parkes (who spent his life between England and Africa) explain what prompted them to leave the UK for Ghana and what makes Africa home for them. Both men are part of a crowd of “young and skilled” who are dissatisfied with life in the West. They, like other reasporans, leave Europe and North America because they feel these regions don’t provide the best environment to pursue self-entrepreneurship. Graham and Parkes make comparisons between the UK, US, and Ghana. They describe Europe as a place of limited opportunities and frustration, where professional skills can be a drawback for disruptive projects. Graham says that, in spite of having two degrees, he had a difficult time finding a job in London in the aftermath of 9/11, and Parkes recalls that European investors were suspicious of his plans to start a business with the agricultural communities of his home country. On the other hand, they see Ghana as a country brimming with opportunities, dynamism, and social mobility. These journeys were driven by professional goals. The feature presents Graham and Parkes as visionary businessmen, committed to bind their happiness to success in Africa. Parkes states that he moved back to Accra to spend the productive years of his life “helping West Africa”. He lists the benefits of relocating in Ghana: “you are a big fish in a relatively small pond”, “networks have real value,” life is better, you are your own master. The narrative of opportunity is part of an ethics of “giving back” to the continent and of cultivating and championing inclusiveness, again, something the interviewees say the UK – and the West at large – lack. This picture of Ghana shows the human face of the narrative of Africa as the next hub of globalization that I discuss in my previous post. In Graham and Parkes’ words, individual accumulation and virtuous industrialization are actually possible in West Africa. More importantly, they seem to happen at a less hectic pace than in the West and without compromising one’s social and affective life. The men promote the romantic idea of a ‘gentle capitalism’, where difference and community life are a resource. While in the UK “identity can be questioned”, Africa seems to accommodate everybody, as long as individuals “innovate”. The timeframe of this acquisite and entrepreneurial phenomenon of return migration is the present. “The time is now” is the mantra of the investigation. Technology is a core element of this development. Graham and Parkes are technology-savvy individuals, seen operating from behind the screens of laptops and cell phones. The screens are visual metaphors of the networking that allows them, and others like them, to take part in affirmative relocation, reconfiguring the flows of exchange of resources, persons, values that Cohen (2008) reads into the destination patterns of a certain typology of migration. Cohen writes of “sojourning” as a recursive diasporic practice that has found new life in the last decades, thanks to delocalized processes of capitalist accumulation. 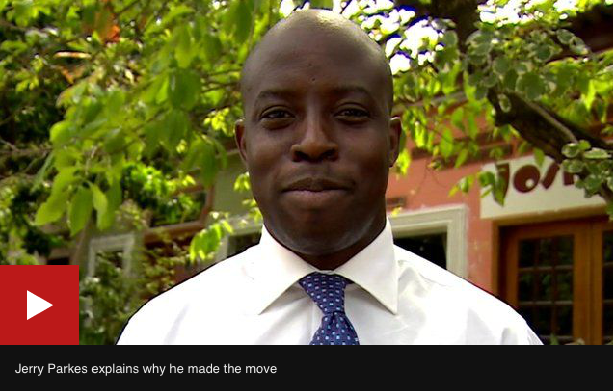 At a moment when many view migration as a burden to the nation states of the West, the BBC’s choice to feature African reasporans is significant for several reasons. Graham and Parkes speak for what look like a “model minority” of high-skilled young entrepreneurs that are changing Africa and, most importantly, its relation to the rest of the world. Like Cohen’s sojourners and Selasi’s Afropolitans, they want to succeed by beating the West at its own game: they draw on their cosmopolitan sensibilities and affordances to bring competitiveness to a new level, across national, economic, and ethnic divides. They are, first of all, actors of an economic reconfiguration driven by a desire to innovate, with important consequences on their sense of affiliation and belonging. While integration in the West can be an asset, they aim at more than fitting in: they want to upturn former colonial hierarchies by making Africa the core hub, rather than the periphery, of modernity. To do this, they change places at a quick pace, producing in some cases a sort of overlapping between the ideas of ‘home’ and ‘headquarters’, where home can be, as in Parkes’ case, the place benefiting the most from innovation, but also somewhere other than your ancestral land. I can’t help but being suspicious of the way reaspora is presented as a desirable model of migration. The statement that “things are much better now compared to five or ten years ago, and people are beginning to see the opportunities in Ghana” contributes to offer return migration as a feasible solution to those who find life in the UK to be “grim”. The lack of context and the generalizations about the experiences of the reasporans are striking. It is significant that they are described as if things took place in an exotic vacuum, in a place where living with “power outages, poor roads, inefficient healthcare systems, or a high cost of doing business” is little less than a discomfort and not the consequence of a seriously unequal distribution of wealth, counterbalanced by working “less than a five-minute drive from home”. Just as striking is the implicit linearity of the migration pattern and the assumption that, once in Africa, these people will not make their way back to the West. Indeed, as they leave their former homes for a life in Ghana, reasporans seem to partly shed their status of migrants from Africa, becoming young entrepreneurs whose right to travel the world is a benefit of their identity of”wealth creators”. Ultimately, these success stories affect what we, in the West, choose to call “migration”. Return migration is not repatriation, nor is it a pattern that can be afforded by many. Reaspora is actually an exclusive phenomenon involving “people of considerable wealth and portable skills” (Cohen 2008: 145). Even too often skills and ambition are not enough to reverse the journeys of displacement and, more importantly, they are not readily available to everybody in the continent. Just as Africa is not a continent solely ravaged by war, terrorism, and famine, neither it is ready to welcome back the millions who left it in search of a better life abroad. Reaspora is not the new narrative about Africa, but only a tiny part of a larger and more complex picture which we, in the West, should be very careful to assess and understand. Cohen, R. (2008), Global Diasporas: An Introduction (Oxon and New York: Routledge).